Hello everyone, and welcome back to our next edition of Disney in Pictures here at My Dreams of Disney! This week’s edition is titled “Living the Disney Dream!” and to be honest, I got the idea from my friend Diane over at the CanDoItMom site! Diane is also known in the blogosphere at MouseFanDiane, and is a member of the Magical Blogorail to boot! Her husband took some absolutely incredible shots of the Disney Fantasy when it was in New York City, and I originally thought of calling this week’s theme “Living the Disney Fantasy!” but Disney Dream just sounded a little bit better, so there you have it, the theme for the week! First up in my photographic journey is two very special photos. These photos are perhaps among my favorite photos, because they are of my grandparents, and if they had never moved to Florida, I may never have even gone to Walt Disney World! Sophie with her Nana, my Grandma! My wonderful Grandpa! I miss you! 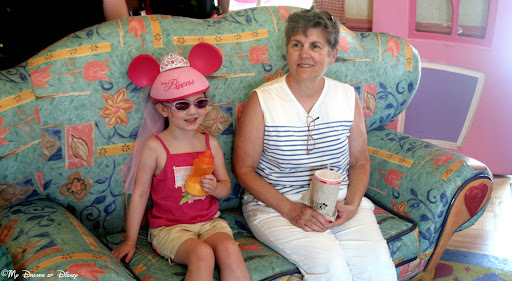 In 2006, we were visiting my Grandparents, and Cindy and I decided that we would take my Mom, who was visiting her parents, to Disney World for the day! Out of that day I have these two shots that show the fun that Sophie was having! Sophie loving the Mad Hatter Tea Cups! My name is Gaylin and when I went on a solo trip to WDW in May of 2008, I realized that if I wanted any photos with me actually in them, I would have to ask other people to take them. I got to chat with a lot of other visitors and met some real ‘characters’. The first is with my friends Mike and Sully at Hollywood Studios, the second is with Chip ‘N Dale at the International Gate at Epcot. Gaylin with Mike & Sully! Gaylin with Chip & Dale! All the classic Disney characters were a part of my childhood. I think “Peter Pan” was the first movie I ever went to. I’m almost 63 now, so seeing the characters at the Disney parks holds very special memories for me. I’ll never forget the first time that I saw Mickey live and in person: I cried with joy. Fast forward a few decades and meet Duffy Bear! It was love at first hug. I used Disney Movie Reward Points to get my first Duffy! 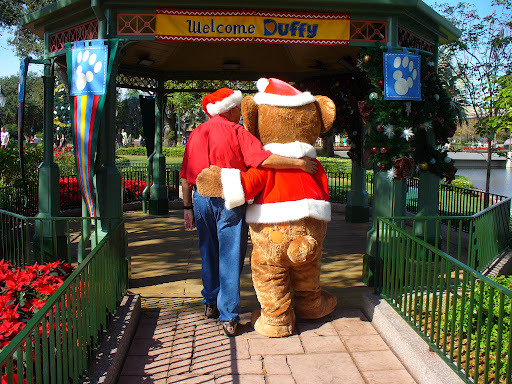 Well…when I went to Epcot this past December I made sure that I was first in line to see Duffy. I was so excited to get quality ‘walking time’ with him up the path to the meet-and-greet. Here’s the photo that a cast member snapped with my camera. This will for sure be on my Disney Christmas ornament this year! This is a picture of our first family trip to Walt Disney World when my son was 17 months old. This is at the Garden Grill and we are all wearing our personalized Pluto Polo shirts. My son is now 5 yrs. old and has been 3 times. It was such a magical time taking him. I read so many people saying it’s a waste of time to take them at that age. But I said, well…I’m going to take him, who cares if he remembers it or not? Disney has the parent switch. We had so much fun as a new family, I am so glad we did not listen to the nay-sayers! Jennifer, her husband, baby, and Pluto! I love the expression on all their faces! 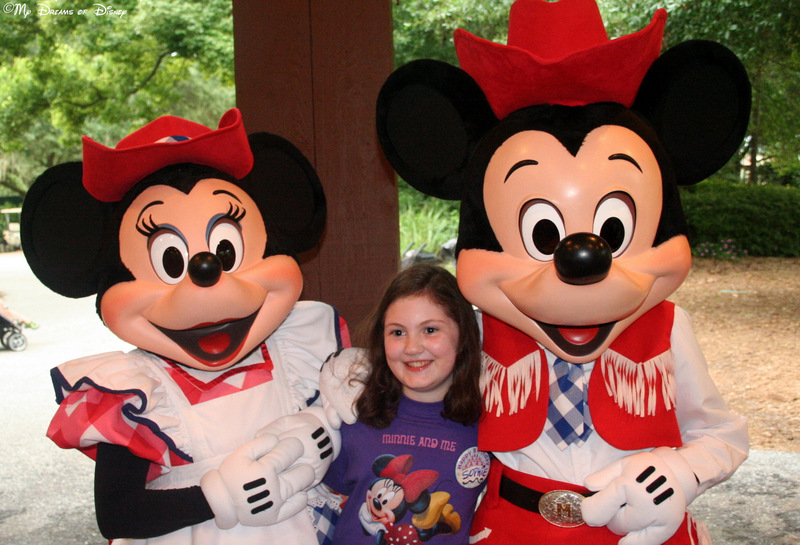 We absolutely loved meeting the Walt Disney World Characters. Meeting them was more than we could have ever dreamed. They were so playful, full of life and well… Character!! Here is one of our favorite photos, taken from the Toy Story Meet and Greet at Disney’s Hollywood Studios. Woody and Buzz were joking around with my daughter and she was having so much fun as you can see by her reaction. If you look closely, you will also notice their cool autographs in her book!! This was what made Disney World Magical for us. These wonderful, happy moments. Hiromi’s daughter with Buzz and Woody! These pictures were taken at the Caribbean Beach Resort. They are special because we got to for the first time stay in a Pirate room at the resort. We love this resort because it is so tropical and relaxing, I think these photos prove that. By the main pool area is a private island called Caribbean Cay with lots of relaxing hammocks and I took advantage of them. My kids and hubby loved it too with the playgrounds, forts and sand to enjoy. From about the age of seven, my “Disney Fantasy” has been to spend the night in the Swiss Family Robinson Tree House. I loved the idea of having a tree house as a kid, and my brothers and I walked those Robinson steps seemingly forever as children. There was no wait, the water wheel was just neat, and everything was so intricately detailed. I could imagine myself living there, eating my meals at the kitchen table, waking up high in a tree. Much to my chagrin, my own children hated Swiss Family Robinson Tree House, just because it wasn’t a ride. I practically forced them (4th, 6th, and 8th grades by now) to walk through with me last summer, late one night, and they loved it. We went back through a second time. We stood at each room and discussed the Zen of tree houses. I lingered too long by the bunk beds, mentally picking out my spot at the top, fantasizing I would be awake when they turned off the lights to Cinderella Castle, dreading the inevitable morning light. You can have Walt’s Cinderella Castle Suite for your fantasy- I’ll take the Robinson tree house. Everybody knows the top bunk is best. Amanda likes the top bunk at the Swiss Family Robinson Treehouse! Thank you everyone for sending in your photos to share this week! I have had an incredible time looking at all of them, in each of them, the Disney dream through your lens has been quite evident, and I’ve seen some things that I had never experience before, particularly Caribbean Beach Resort, since we’ve never stayed there before. Thank you all for sharing! I’m going to close with a flurry of photos of things that really illustrate the way that we live the Disney dream! Enjoy! The view from the 11th floor of Bay Lake Tower! Meeting my friends from Pixie Vacations!